Herbs, perennial, robust, tufted, 4--10 dm. 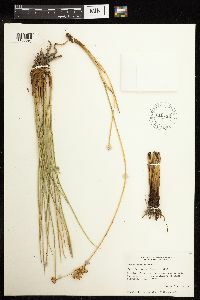 Rhizomes short. Culms terete, 1.5--2.5 mm diam. Cataphylls several, reddish brown, often apiculate. 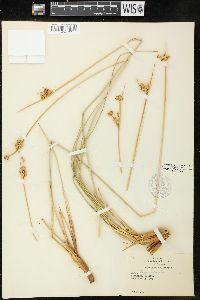 Leaves basal, 1--2; auricles essentially absent; blade terete, 10--40 dcm, shorter than culm. 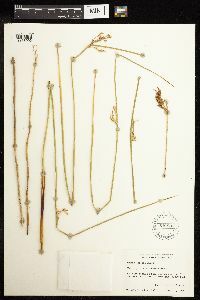 Inflorescences glomerules 3--12, each with (1--)2--5 flowers, open, branches unequal, 3--12 cm, primary bract terete or slightly compressed, shorter to longer than inflorescence. 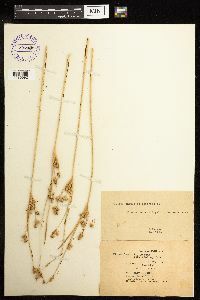 Flowers: tepals straw-colored to pale green, ovate-lanceolate, 4--5 mm, apex acuminate or setaceous; inner series elliptic, nearly equal, margins wide, scarious, apiculate; stamens 6, filaments 1 mm, anthers 1.5--2 mm; style 1 mm. 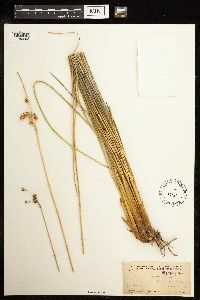 Capsules tan to light reddish brown, 3-locular, ellipsoid, 3.7--4.5 x1.6--2 mm, mostly shorter than or nearly equal to perianth. 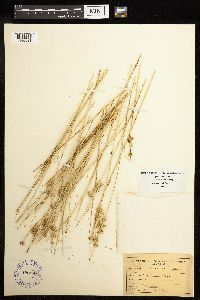 Seeds dark amber, obovoid, body 0.7--1 mm, tails 0.1--0.5 mm. Flowering and fruiting spring--summer. Saline flats and meadows or edges of salt marshes; below 600 m; Ariz., Calif., Nev., Utah; Mexico.